Climate change poses a risk to business operations and to markets, and a poor business response to this risk can lead to reputational damage, or worse. At the same time, climate change can bring opportunities for some businesses. 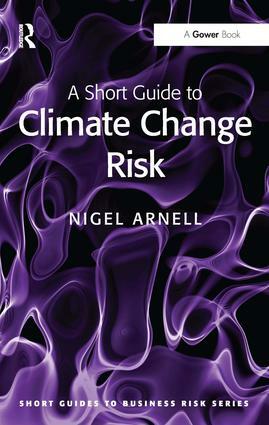 In this addition to Gower’s series of Short Guides to Business Risk, Professor Arnell, one of the world’s leading experts in the field, reviews this critical area of risk posed to businesses and other organisations by climate change and considers how they can respond to this threat. A Short Guide to Climate Change Risk focuses on the impacts and consequences of climate change rather than on business use of energy or business and 'sustainability' issues. The author examines the advantages and disadvantages of different approaches to addressing these risks, with international case study examples. With chapters on the nature, science and politics of climate change, on the assessment and management of climate change risks, and recommendations for incorporating climate change risks into a Company Risk Management System, this concise guide serves the needs of business students and practitioners across a wide range of sectors, public and private. Contents: Climate change as a business risk; The science of climate change; The consequences of climate change; The politics of climate change: the regulatory context; Assessing climate change risks and opportunities; Coping with the risks of climate change; An overview; Index. Nigel Arnell is the Director of the Walker Institute at the University of Reading, and Professor of Climate System Science in the Department of Meteorology. He was formerly Professor of Geography and Head of the School of Geography at the University of Southampton. He trained as a geographer and has worked as a hydrologist. Professor Arnell has been researching the impacts of climate change for over 20 years and he helped develop methods used in the UK for assessing climate change impacts on water supply companies. He has close working relationships with companies in a number of business sectors and with UK and other government departments and agencies. Professor Arnell has contributed to all the assessment reports of the Intergovernmental Panel on Climate Change (IPCC) since 1995. Risk is a far more complex and demanding issue than it was ten years ago. Risk managers may have expertise in the general aspects of risk management and in the specifics that relate directly to their business, but they are much less likely to understand other more specialist risks. Equally, Company Directors may find themselves falling down in their duty to manage risk because they don't have enough knowledge to be able to talk to their risk team, in a sensible way. The short guides to risk are not going to make either of these groups experts in the subject but will give them plenty to get started and in a format and an extent (circa 150 pages) that is readily digested.